Have you entered wrong bank account details in UAN member portal and don’t you know how to delete incorrect bank account number and IFSC code in UAN portal then read this completely. When you enter incorrect bank account details then you don’t get your PF claim amount. Even though PF claim settles but your amount again sent back to the PF fund within 2-3 days. In that case, you need to correct your bank account details and you need to apply for PF again (or) you need to take a PF reauthorization letter from your PF office and fill and submit it again to the PF office. There is no separate process to change already approved bank account details on UAN portal, you need to update your new bank account details again and tell your employer to approve them. Once your employer approves your new bank account details with their digital signature or e – sign then your old incorrect bank account details will get deactivated and new bank account details will get activated. So next time, when you apply for PF then the PF portal will consider your new approved bank account details automatically and claim amount will be sent to the new bank account number. 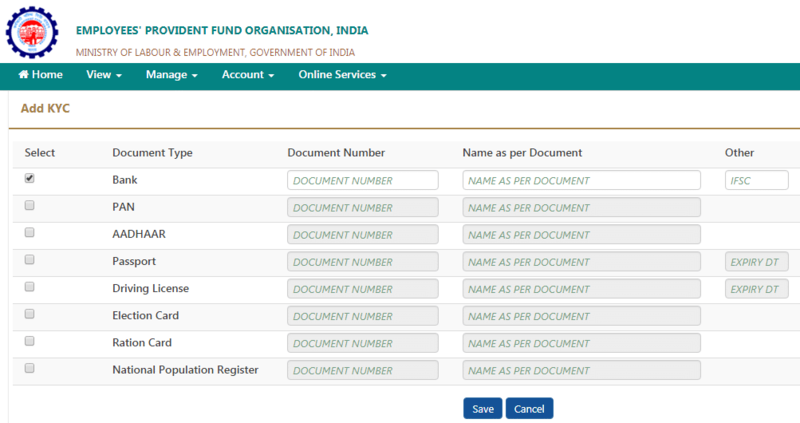 Now go to manage option in the menu bar, and select KYC from the drop-down menu. Now tick on bank account number and enter your correct bank a/c number, name as on bank account and IFSC code of the bank and click on save. Once your employer approves your bank account number then you can claim for your PF amount and PF will be credited into the new bank account within 10-15 days.